The word automat is the latinization of the Greek word αὐτόματον, which means acting of one's own will. It is more often used to describe moving machines, especially those that have been made to resemble human or animal actions. Many ancient mythologies include artificial people, e.g. the mechanical servants built by the Greek god Hephaestus (Vulcan to the Romans), the clay golems of Jewish legends and clay giants of Norse legends, and Galatea, the mythical statue of Pygmalion that came to life. In Greek drama, Deus Ex Machina was contrived as a dramatic device that usually involved lowering a deity by wires into the play to solve a seemingly impossible problem. The Egyptian Amenhotep, son of Hapu, had made a statue of Memnon, King of Ethiopia, near Thebes in Egypt, which uttered a melodious sound when struck by the the suns rays in the morning and during sunset. It was suggested that a divine power was partly responsible as the mechanisms were far too simple to sustain the noise. The king stared at the figure in astonishment. It walked with rapid strides, moving its head up and down, so that anyone would have taken it for a live human being. The artificer touched its chin, and it began singing, perfectly in tune. He touched its hand, and it began posturing, keeping perfect time... As the performance was drawing to an end, the robot winked its eye and made advances to the ladies in attendance, whereupon the king became incensed and would have had Yen Shi executed on the spot had not the latter, in mortal fear, instantly taken the robot to pieces to let him see what it really was. And, indeed, it turned out to be only a construction of leather, wood, glue and lacquer, variously colored white, black, red and blue. Examining it closely, the king found all the internal organs complete—liver, gall, heart, lungs, spleen, kidneys, stomach and intestines; and over these again, muscles, bones and limbs with their joints, skin, teeth and hair, all of them artificial... The king tried the effect of taking away the heart, and found that the mouth could no longer speak; he took away the liver and the eyes could no longer see; he took away the kidneys and the legs lost their power of locomotion. The king was delighted. According to Jewish tradition, the King of Israel Solomon (1011-931 BC), great in wisdom, wealth, and power, used his wisdom to design mechanical devices. There is several versions of a story about a miraculous throne, design by or ordered by Solomon. The most modest story features an ivory throne surrounded by golden lions, 12 of them altogether on both sides (eventually each lion faced an eagle). There is however a much miraculous (upgraded:-) version, speaking about a moveable throne with mechanical animals, which followed Solomon, wherever he wished to go. The throne was fashioned of ivory and covered with gold. It was set with rubies, sapphires, emeralds and other precious stones that shone with the most brilliant, the most dazzling, the most fascinating hues and colors. The throne was surrounded by 72 golden lions, facing 92 golden eagles. Six steps led to the seat of the throne, and each step served to remind the king of one of the six special commandments that the kings of Israel were commanded to observe. On the first step a golden lion lay, facing a golden ox on the opposite side. On the second step a golden wolf opposite a golden lamb. On the third step a golden tiger faced a golden camel. On the fourth step a golden eagle faced a golden peacock. On the fifth a golden cat faced a golden rooster, and on the sixth a golden hawk faced a golden dove. Higher still, above the throne, a golden dove held a golden hawk in its beak. When the King stepped upon the throne, a mechanism was set in motion. As soon as he stepped upon the first step, the golden ox and the golden lion each stretched out one foot to support him and help him rise to the next step. On each side, the animals helped the King up until he was comfortably seated upon the throne. No sooner was he seated than a golden eagle brought the great crown and held it just above King Solomon's brow, so that it should not weigh heavily on his head. When the King sat, to judge the people, the wheels began to turn, and the beasts and fowls began to utter their respective cries, which frightened those who had intended to bear false testimony. Moreover, while Solomon was ascending the throne, the animals scattered all kinds of fragrant spices. According to the legend, King Solomon's miraculous throne was the talk of all the reigning kings and princes. They came to marvel at its wonders and admire its beauty. When later the Egyptian king Shishak invaded the land of Yehudah, he ordered to carry away this wonderful throne. Still later, when the Babylonian King Nebuchadnezzar (605-562) destroyed the Temple of Solomon and subsequently conquered Egypt as well, he carried the throne away to Babylon. But when he tried to ascend it, the lion threw him over, and he did not venture to sit on it again. Later, King Darius of Persia conquered Babylon and carried the throne with him to his capital. Around 520 B.C. lived the greek mechanician Daedalus, who was a prolific and very clever inventor of ancient times, accredited with the axe, the level and numerous other mechanical devices. He was reputed to have made statues that were worked by quicksilver and had the ability to walk. A more creditable description is of stone statues that seemed to breath in or move their marble feet. Given Daedalu's proven abilities he certainly was capable of inventing and making some form of mechanical statue. In the 5th century B.C. the Chinese engineer King-Shu Tse had made a flying bird (magpie) constructed out of wood and bamboo. He also devised a wooden horse worked by springs, that could jump. In the end of 5th century B.C. (around 400 B.C) the ancient greek scientist, a renowned mathematician and politician—Archytas of Tarentum (see the nearby image) (Greek: Ἀρχύτας; 428–347 BC), Magna Graecia (now southern Italy), made a wooden pigeon suspended from the end of a pivot, which was rotated by a jet of water or steam. The pigeon simulated flight and said to have actually flown some 200 meters. Most of the modern scholars assume that the free flying bird of Archytas was actually a hollow decoy filled with compressed air and connected to a pulley system. When the air was released, it may have caused the bird's wings to flap and triggered a counterweight, which lifted the automaton from one perch to another and gave the impression of flight. 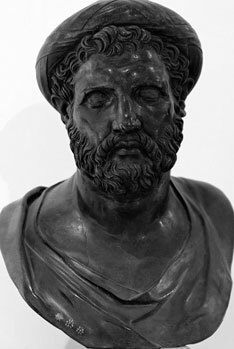 Archytas is the alleged inventor of the screw and the pulley (crane). Again given his abilities it seems likely that he did invent a mechanical pigeon. Later automata—Greek-Roman, Arabic, western European. The next stages of the development of automata are closer to our time, so there is much more and reliable information for them. They were products of the Greek-Roman civilization, Arabic civilization and will be featured in other pages of this site. However, we are not going to investigate the legendary automata (talking heads and others) claimed to have been constructed by Gerbert d'Aurillac, Albertus Magnus, Roger Bacon, Robert Grosseteste and Johannes Regiomontanus, because there are not neither working models, nor written descriptions survived to our time.